Volleyball players Iris Tolenada, Halimah Oswald, and Robyn Hall, left to right, prepare to defend against Sonoma State, Nov. 11, 2011. The Gators were swept in three sets in the penultimate game of the 2011 season. Photo by Jamie Wells. The Gators couldn’t prevent history from repeating itself as the University’s volleyball team surrendered a 3-0 sweep to nationally-ranked #23 Sonoma State Friday night in Rohnert Park, Calif. 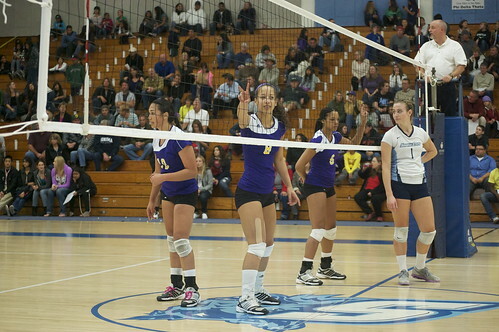 In the final weekend of the 2011 season the team couldn’t sustain momentum long enough to topple the tough Seawolves’ offense and fell 19-25, 20-25, 12-25. There was little the Gators could do right against the second-place Seawolves, hitting just .078 as a team, while Sonoma hit .290 as a whole. The Seawolves, however, made nine serving errors, but the Gators failed to capitalize in those key situations and also committed six faulty serves. The Gators weren’t able to stay focused during the many long rallies of the game. “It’s tiring but the worst part about losing those long rallies. It takes a lot of momentum out of us,” Oswald said. It was the second time Sonoma has swept the team this season. The Gators lost at home Oct. 8 with similar results: 20-25, 13-25, 24-26. Sonoma improved to a 17-4 California Collegiate Athletic Association record while the Gators fall back under the even mark at 10-11 in conference play. The team finished the season with a trip up the coast to visit Humboldt State, 5-16. The Gators swept the Lumberjacks at home in October and are looking to repeat that success. “We’re like the tale of two teams. We’ll have one good night, one bad night. I think tomorrow will be a good night,” Hall said.